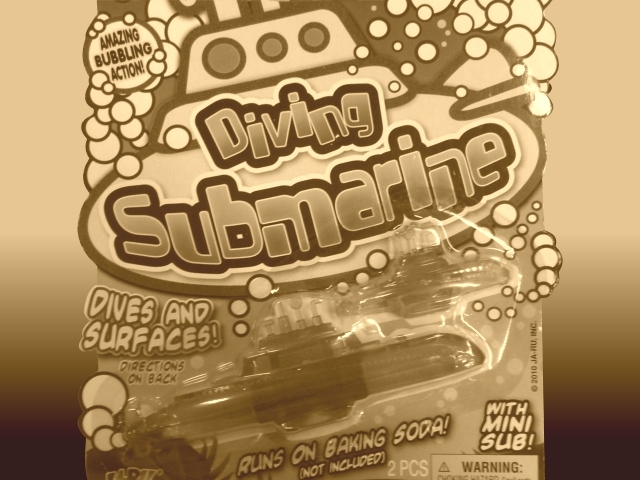 Long before electronic game consoles, kids in the 1950’s had amazing toys like the baking soda diving submarine shown here. The plastic toy submarine had a small cavity in the bottom and a removable metal cap that plugged the cavity hole. Seeing how it worked was both entertaining and educational. Okay, perhaps entertaining for about 10 minutes, yet educational. The first step is filling a bucket or the kitchen sink with 8-10 inches of water. Any container or the family pool will do. Next, fill the submarine’s empty cavity with a pinch of baking soda, secure the metal cap, then drop the sub into the water. 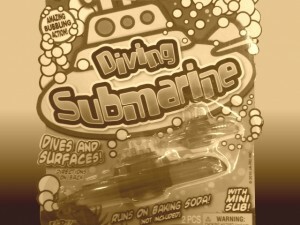 The submarine toy sinks to the bottom. Science takes over. As water seeps in and reacts with the baking soda, bubbles appear. Eventually, and this could take 10 minutes or more staring at the sunken sub, the submarine magically rises to the surface. Lesson over. Once was enough. Seems the educational part is subtle. Someone somewhere invented this sucker and made a fortune.